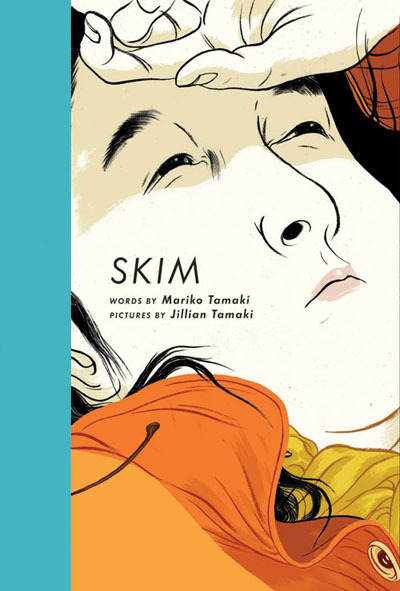 Skim, by Mariko Tamaki and illustrated by Jillian Tamaki, has won a plethora of awards for graphic novels, for young adult books, for illustrations, etc. So when I had some time in Borders the other day, I grabbed it (and Burma Chronicles, which I only read half of but really enjoyed and is now coming to me via ILL). And I finished it in one sitting! Skim is a tenth grader at a Catholic high school in Canada. She is a half-Asian who is dealing with divorced parents, trying to be a Wiccan, falling in love with her female English teacher, isolating herself from a best friend and recovering from a broken arm. One day at school, she learns that a very popular girl's boyfriend committed suicide, and rumors fly that he did so because he was gay. The school population reacts by forming a Girls Celebrating Life club, but that only makes Skim and others feel even more isolated. Wow, there was a lot of teenage angst in this book! I enjoyed the story, but not in a happy way. More in appreciation that an author and illustrator can so empathize with a feeling of supreme isolation, and convey that empathy so beautifully. If I were in high school and felt as lonely as Skim, then I think this book would probably cause me to burst into tears. 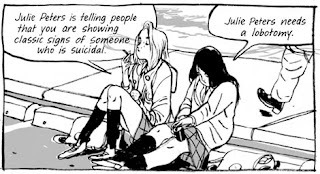 There is so much here- depression, friendship, sexual orientation, a desperate need to fit in while also wanting to be yourself. I think the Tamaki duo hit exactly the right tone with this book. Skim is sullen and moody. She doesn't talk much, but writes in her diary. She doesn't connect with her parents. She doesn't do well in school. She doesn't like Romeo & Juliet. She is a nice person, but always feels awkward. This may sound odd, but I loved that Skim's friendships in this book were so complicated. Like many people at that age, she doesn't have a best friend with whom she can share everything. She doesn't go over to her friend Lisa's and giggle over boys or listen to music or have all-night pedicure sessions. Lisa obviously cares about her, and worries about her, but she also gives Skim space. This was so realistic. Some of my best friends now were my best friends in high school, but we never had a smooth friendship in high school. There were arguments, moments of isolation, anger and sometimes a complete lapse in communication. And that is what happens with Skim and her best friend, too. I also thought the illustrations in the story were great. It amazes me that one person can write a story and a completely different person can tell that story through pictures, and it can come together as seamlessly as it did here. There is depth and emotion in black ink, and Tamaki brings it out in a wonderfully detailed manner. Also, I think it would be a lapse for me not to say that I'm just glad a story about a girl like Skim exists. She's a chubby half-Asian goth who may be a lesbian. Thank you Tamaki duo for bringing a character like this to life in such a real and sympathetic way. I don't think Skim is the sort of person who usually stars in young adult novels, and I'm thrilled that she's here and that the book was such a success. I'm so with you Aarti!! I'm just thrilled that this book exists. Glad to see that you got to this one :) It's one of my fav graphic novels out there. I wish it had a larger audience! lovely blog. came here via shweta's blog, and am loving it here. will be following you from now on! was reading through your old posts and find a wonderful book meme that i'd like to take up. hope you don't mind! I agree with Nymeth, I always wonder why my friendships were never perfect - and still aren't actually! Sounds like a really great book! I'm glad you enjoyed this one. I discovered graphic novels through the artwork, lots of color and effect, but have since found some of the best are on done in pen and ink or pencil. Your review has me wanting to read this one again! This sounds like a book I might enjoy. The way you described the main character, I don't think I've read many (if any) characters similar to her. Will pick this up. Wow. This sounds like quite a read. I will have to look for it. Thanks for bringing it to my attention, Aarti. Skim sounds like a character I want to get to know better and probably could relate to. Sounds good to me! I'd have to check it out! It sounds like this book has some really realistic features and I think it's one I would like. I am in the midst of a house full of angsty teenagers right now, so this might not be the perfect time for this book, but it is definitely going on the list for when things calm down. I am glad that yo connected so well with this graphic novel! I love that you mentioned the friendship aspect of the book. I read this one a while back and loved it too. Looks like everybody does! 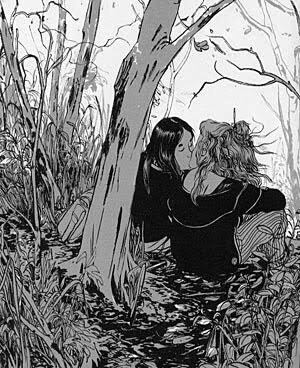 Now I know that you really would love Hiromi Goto's Half World too, and I am feeling terrifically chastened for not having mentioned Jillian Tamaki's striking illustrations in that 2009 novel. For others who've enjoyed Skin, here's a link to the trailer of Half World for a peek at Jillian Tamaki's work therein. Ack! I didn't realize I didn't respond to ANY of the messages in this thread. I was in Minneapolis this past weekend and must not have done any responding while there. So here's a general response. Yes, I think the friendship aspect of this book is excellent and real and true and well worth the read. Buried in Print- I am definitely looking into Half World! I added this to my list a while ago and forgot about it because my library didn't have it (I have the attention span OF A GNAT). But it sounds even wonderfuller now than it did when I first read about it. I'm curious what sort of tempestuous friendship storms there are in this book - I didn't have perfect idyllic friendships in high school, exactly, but I had some very close, reliable friends. I'll be interested to see how the book compares to my own experience. Ooh. It's just been added to my wishlist after your review! I love the idea of this book, but I agree that if I'd read something like this while in school it might have been too much.